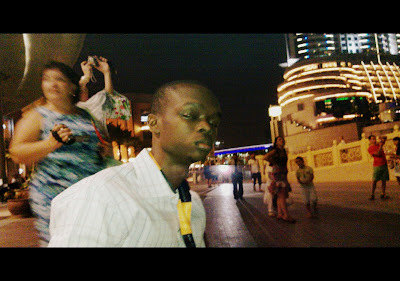 [October 13th, 2011] - It’s a windy evening in the city of Dubai. Here am I, sitting just outside of KFC with a golden krusher in my hand whilst admiring the seemingly busy Deira district. Dubai is a beautiful place, but not so much as I thought. Yes it’s something more; it unfathomable. Its beauty can't be described with words. If I have to describe Dubai, all I would say is; See It For Yourself. While sipping on my krusher and reminiscing on my journey to this tourist hub, my start off point was from Lagos, Nigeria. I didn't have much to recall about the Lagos portion of the trip, except for the rowdiness at the check-in counters and seemingly baking-temperature environment [you'd make big bucks selling ice cubes in there]. Still on thoughts from Lagos, what more? Ok, maybe the trotting officials of the immigration service who would always seek to know how much you are travelling with, so that they could demand a decent percentage, especially when they get the clue that you're a first time international traveler (well, they met the wrong person). Nonetheless, the high-point of my trip from my Lagos kickoff point was when I boarded the beautifully bodied Qatar Airways flight, fully knowing that in few minutes, I was going to be leaving my beautiful country for a while (o yes its beautiful - I love Nigeria). Still reminiscing; the in-flight entertainment aboard the Qatar Airways flight from Nigeria was awesome. Had like an infinite number of movies and audio songs. However, while these in-flight music and movies would interest the average traveler, same wasn't the case for me. My interest was on the in-flight map, which showed real-time movements of the plane as we flew over various Nigerian cities, nations, historic buildings etc. For some reason, when we got into Sudan's airspace at a height of over 30,000ft, I found myself looking down with keen interest. I bet you can't blame me. I had heard so much about Sudan over the years and it would have been a wonderful feeling to see a landmark or just have a view of anything in Sudan from the skies. On the foods that were served, I'd say there wasn't really anything about the food that was worth recalling. Nonetheless, everything was so available that my mind seemed to want me to believe that I was served a meal every thirty minutes in the 9 (nine) hours flight. Still reminiscing; our flight from Lagos landed at Doha International Airport, Qatar, at exactly midnight. Lest I forget, the sight of Saudi Arabia from the night skies was priceless, just few minutes before our landing in Doha. Landing in Doha wasn't as exciting as I thought. The airport was no doubt very large but then, it came across to me like any other international airport. For some reason, I didn't get that expected WoW factor. Still in Doha whilst waiting for the connecting Qatar Airways flight to Dubai, I started having these mixed feeling like maybe my choice of transiting through Doha wasn't that much of a good idea after all. My thoughts couldn't get any worse as I began to feel the intense cold from the heavily air-conditioned waiting lounge, coupled with my light clothing of just a shirt and a jean (no coats or sweaters as there were all in my checked-in luggage). I gave my best shot at keeping warm but still wasn't good enough, especially as I still had over 4 (four) hours before my connecting flight. Anyway, I found a solution, though it was one that came at a price. I resorted to this Costa Coffee Beanery, which served very hot tea or coffee depending on your choice. I got some relief from the intense cold after a first cup of tea that cost around $5.50c. Anyway, this relief didn't really last that long as my body was back to a freezing state the very moment I was done with the tea. Many cups of tea followed soon after, of which am certain had cost me close to $100, all in trying to keep warm using their concoction of hot water, milk & lipton (the tea was a bit tasteless). Thanks to my VISA card as all the bills on the colored hot water solution was payed-for just by a swipe, at least I didn't have to see the money leave my pocket. Anyway, I survived the seven hours of waiting in transit and sure that was my first and neither do I intend to consciously put myself through such waiting times ever again. We finally set off on the final leg of the trip from Doha to Dubai. This portion of the trip basically had no highlights except that the flight was rather empty but far more sophisticated than the plane that took us from Lagos to Doha. (Both legs of the trip were manned by same carrier, Qatar Airways). Landing in Dubai was quite a nice sight as we flew very close to the ground over Palm Jumeirah. Nonetheless, the airport didn't really excite me, couldn't say why, but maybe igniting the WoW factor in me requires something really breath-taking. Landing at the Dubai airport was like any other international trip, but stepping out of the airport was something worth remembering. For a second, I thought the Sun had its home in Dubai. The heat / hot-breeze that welcomed me, was a first of its kind (no wonder I never saw any non-air-conditioned car throughout my stay in the city). While still in my thoughts, I was warmly interrupted by a friend from Nigeria who said we must get to see the breath-taking water-display at the Dubai Mall. Waiting for the water-display at the Dubai Fountain Arena, Dubai Mall. The tag on my neck is my GITEX Conference gate-pass. I bet I wasn't yet done in my thoughts but then I was interrupted and so were my thoughts. Anyway, until next time, always ensure to relive those worthy moments in your life and don't forget you could always relive your beautiful moments over and over again in your thoughts and more-so for free.